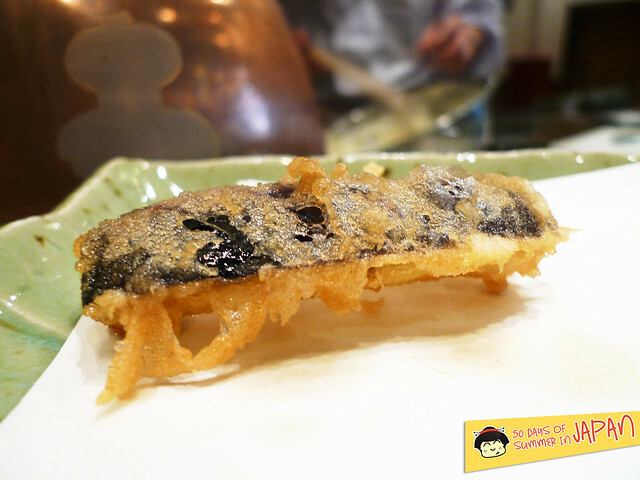 After reading reviews about 7chome Kyoboshi, the 3 michelin star tempura temple, I was infatuated. 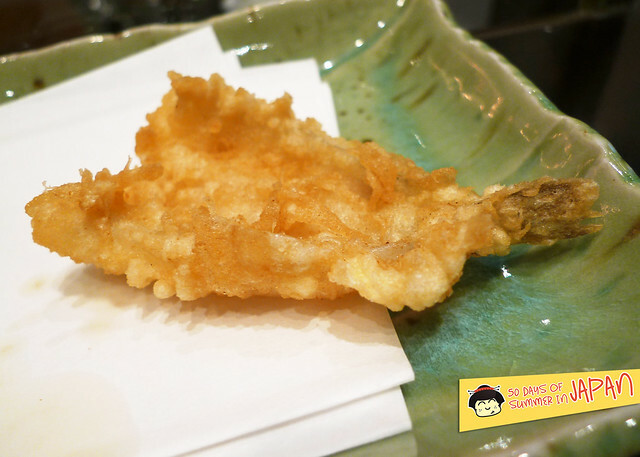 But shedding $400 of my hard earned dollars for tempura, as divine as it may be, just couldn’t be justified. Maybe if I won the lotto? Or money suddenly feel from above as I walked the streets of Tokyo. As you see, chances at this point are slim. My knowledge and appreciation for tempura doesn’t reach michelin star level anyways, so I figured I’d start local and eventually work my way up. Slowly shedding out extra dough for fancier versions and taste what the fuss is really about. 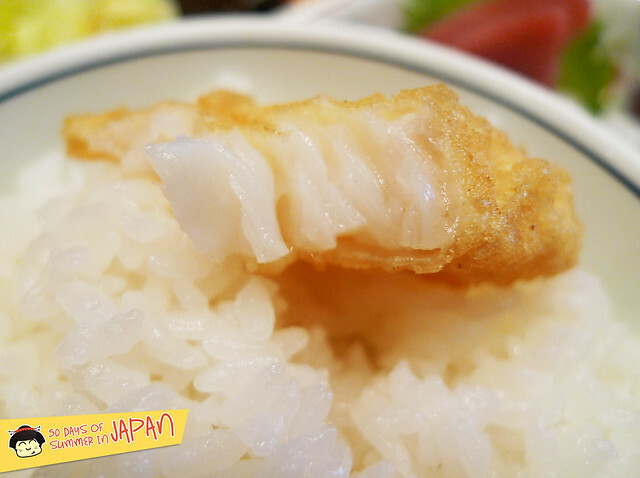 For lunch today, I stopped by Tempura Hisago and had their Edo-style tempura lunch. The lunch set was about $27. Sashimi and salad. 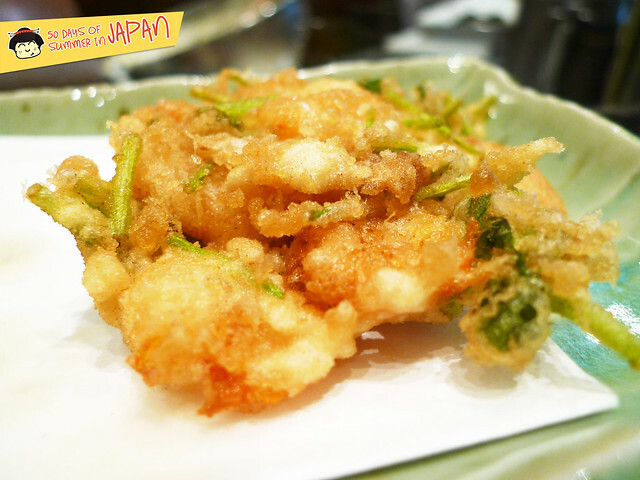 Shrimp, fish and vegetable tempura. 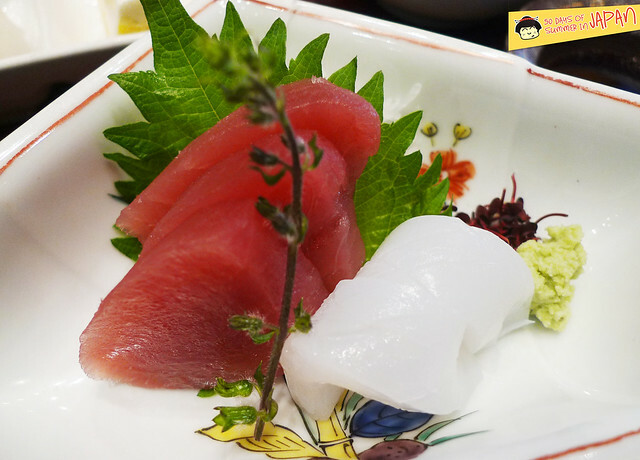 The sashimi was quite fresh. Tuna and squid. But nothing scandalous. 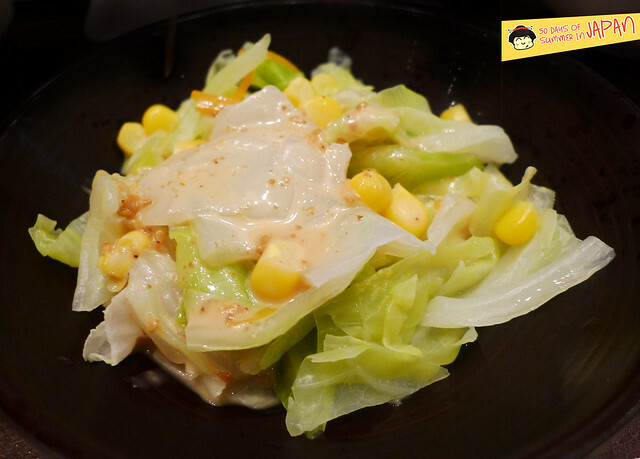 The boiled cabbage salad and sweet corn were light and summery with that sesame dressing. 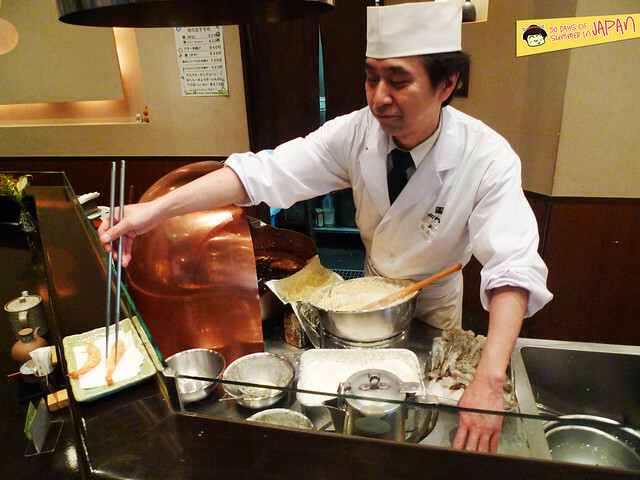 I sat by the bar watching the frying show as the chef fed me piece after piece of lightly fried ingredients. The batter was a bit thicker than I would of liked but that seemed to differ according to each piece. The shrimp was very fresh and sweet. Crisp and crunchy. An eat your heart out “fish and chips” shouted from within after taking a bite of this warm, flaky piece of white fish. Very moist. The whole fish was naturally saltier. The pumpkin came with the thinnest coating of batter. Nice and crisp though a bit oily. Though keeping the light and crisp exterior, I think the nature of the eggplant itself just absorbed more oil than I would of liked. Their shrimp “ball” had a generous amount of shrimp with fresh herbs in between. 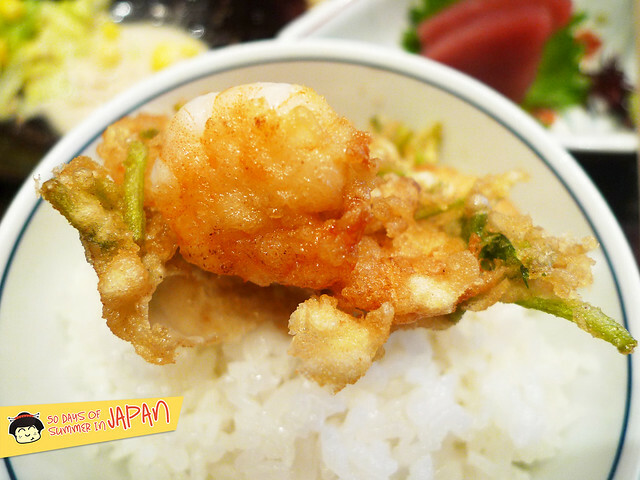 Though bathing in oil, the bouncy sweet shrimp were small in size but huge in flavor. I totally enjoyed the combination. 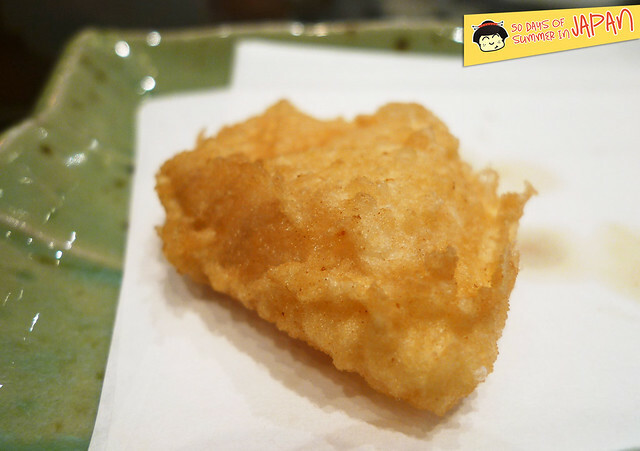 While ordering, I wondered if I should gotten more tempura, but it turned out to be enough fried food for one sitting. 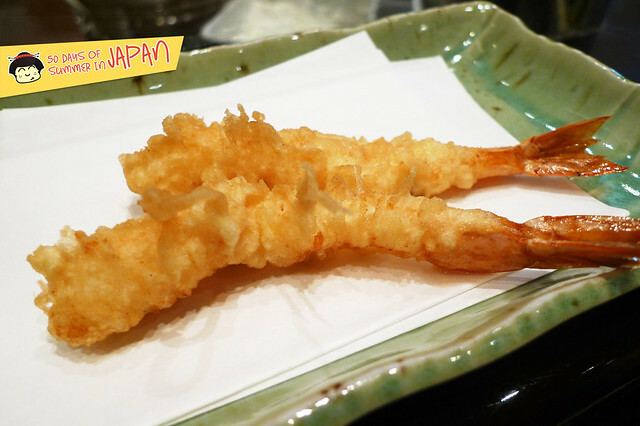 Overall, it didn’t take my love for tempura to any new heights, but it was better than the usual Japanese restaurant in NYC. 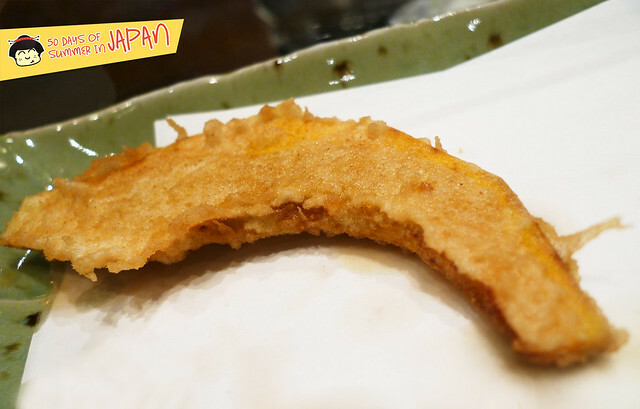 From what I read, $400 would get me a tempura so light and heavenly, it won’t clog my arteries. Nor will it have any trace of being “oily”. Therefore, I can only go up from here.